The same sort of nostalgic feeling wells up inside of me when I think of how the world could be if only people and governments put just a bit as much effort into improving people's lives as they do into military expenditure and when I think of being eleven years old and going to the World's Fair. My father taught us indignation against the government and the Church because of the war in Vietnam through nightly commentaries on the news. Moral conscience and religion must stand opposed to the war, and the government has failed us by carrying out war, bombing, atrocities, propaganda, and militarization, and the Church has failed us by not issuing a clear condemnation of it. So, when we went to the Fair in 1964 and found the dedication of the Unisphere to "Peace and Understanding," it meant a lot. It was a statement against militarism and in favor of the ideal of peace. When I think of how much war and horror remains in the world today, forty-two years later, I sigh for the longing of the idealism of the nineteen sixties, for not being able to return to childhood, and for not having been able to achieve peace in the world. 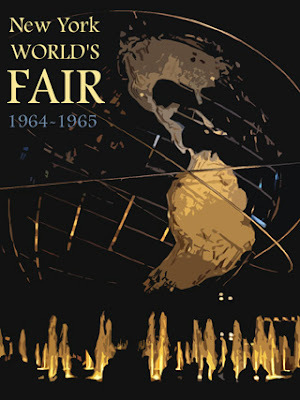 The 1964 World's Fair was held in Flushing, New York, on Long Island. Only a few remnants remain, including the New York and Port Authority buildings, and the Unisphere sculpture, right, symbol of the fair. The other exhibits, all built to building codes for permanent structures, were torn down after the two year run of the fair. The cost of the Fair was so high that more recent expositions have trimmed their scope, and it is not likely so ambitious a fair will be done for decades. Click on the text above for Roy Latham's site, where there are links to some of the photographs he took as a teenager at the fair. I took the pictures below in 2005. It seems such a waste, that the ideals and the buildings have been allowed to fall into disrepair. 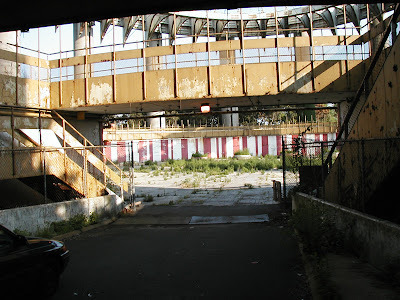 For some years there was an effort to refurbish the old NY State pavillion, but the plans offered were never funded. 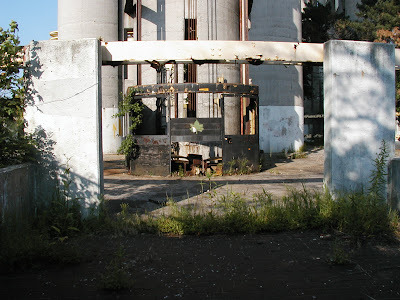 According to Bill Young (to whom I am grateful for his efforts to preserve the history of the Fair and improve the site) the city and park departments have done nothing for the ruins of the pavillion, and it must be destroyed or stabilized or it might just collapse! We take this opportunity to present a final report of the proposed Air and Space Museum project at the New York State Pavilion, Flushing Meadows-Corona Park, Borough of Queens, New York. Thank you to the many people who gave us encouragement and support in Queens Borough government and the New York City Department of Parks & Recreation in our effort to stabilize and develop an adaptive reuse for the pavilion. In particular we would like to thank New York City Parks Commissioner Adrian Benepe, Assistant Parks Commissioner for Queens Estelle Cooper, former New York City Parks Commissioner Henry Stern, Deputy Commissioner of Capital Projects for the New York City Parks Department Amy Freitag, Queens Borough President Helen Marshall, former Queens Borough President Claire Schulman and their staffs for graciously allowing us to present our proposal and for their consideration of our project. Many hours were spent by them attending meetings, reviewing proposals, researching documents, and a vast variety of other work that needed to be done to honestly evaluate a monumental proposal of turning a derelict, decaying structure into a glittering Air & Space Museum. Thank you to the many people who have followed our project since 2001 -- who have given us a pat on the back when it they felt it was deserved, a gentle prod when they felt it was needed and a shoulder to cry on when we needed it as well. Thank you for your interest, support, encouragement and kindness over the years. It was appreciated more than we can say. 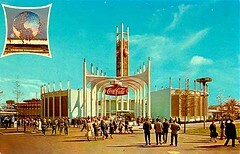 In June of 2004, the New York City Department of Parks & Recreation issued a Request for Expressions of Interest (RFEI) to allow parties to submit ideas, concepts and plans for the stabilization, restoration and adaptive reuse of the New York State Pavilion. The Air & Space Museum proposal was one of only two RFEIs submitted. Six weeks after the deadline, New York City Parks Commissioner Adrian Benepe announced that none of the submissions had addressed funding concerns and, therefore, the RFEI was canceled. At that point, further efforts to continue with the project were halted since it seemed fruitless to continue working with a Parks Department who were obviously no longer interested in our efforts toward stabilization and reuse of the pavilion. A reprint of the Concept Page of the original website to preserve the original concept of the Air & Space Museum, online. A Timeline of Events dating back to 1992 when the first engineering report was commissioned by the Department of Parks & Recreation of the City of New York to determine the structural stability of the NY State Pavilion. The majority of the timeline focuses on our efforts to stabilize and restore the NY State Pavilion into a world-class Air & Space Museum. Publication of documents (in PDF format) pertinent to the project. These include the copies of the engineering reports we obtained from the Parks Department detailing the deterioration of the structure, the RFEI put out by the Parks Department and our response, among others. Parting comments about the project by key members of the team. Perhaps, with the facts presented, those interested in this project -- or future projects regarding the NY State Pavilion -- can draw their own conclusions as to why it could not move forward. Somewhere in the files of the NY library, there is a recording of the speeches made at the reopening of the Fair in 1965. An unidentified person made a speech about "Peace through Understanding." Willy Brandt was also on the program. I wonder who made the speech about "Peace through Understanding," if it was any good, or just the wish that peace would spread through the world with technology and corporate influence, like the Coca-Cola bottles to be found at that company's exhibit, placed tastefully among exotic scenes depicting various wonders of the world and other sights.